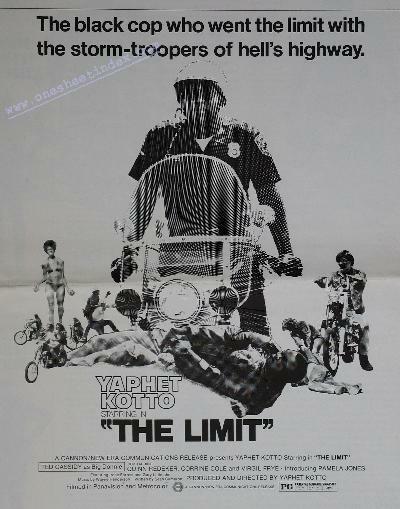 High tension builds from the outset when Mark Johnson (Yaphet Kotto) and Jeff McMillan (Quinn Redeker) have their first encounter with the chopper gang, the Virgins. Mark, black and Jeff, white, are Los Angeles motorcycle police officers, close friends both on and off duty. But Mark has no way of knowing that this chance meeting with the Virgins will one day nearly cost him his life. The Virgins, like most motorcycle gangs, are a motley group. Their leader, Big Donnie (Ted Cassidy), has been riding a long time and beginning to feel, inwardly, that there is a better way of life. With him on his chopper is his pregnant girl friend, Judy (Corinne Cole). Most hostile of the group is rebellious Kenny (Virgil Frye) who is scheming to replace Big Donnie as the Virgin's leader. as strength and begins to look at him in a different way and with a new respect. Big Donnie's respect for Mark becomes more evident after each encounter between the Virgins and the two cops. He finally confesses to Judy, who has taken Mark's advice and stopped riding, that he would like to quit the gang. However, as Big Donnie's admiration for Mark grows, so does Kenny's hostility. This, coupled with his envy of Big Donnie's position as gang leader, finally manifests itself and endangers both Mark's girl friend Margret (Pamela Jones) and Judy. With some of the gang members, Kenny breaks into Margret's house looking for Mark. When he doesn't find him, he vents his anger and frustration by beating Margret. He follows this up by persuading Judy to break her promise not to ride a chopper until after her baby is born. Rashly, she seats up behind Kenny, who roars off at full throttle. Assistant Film Editor .......................... Freeman Davies, Jr. AUTOMOBILES: .......................... Chrysler Automobiles courtesy of Chrysler Corp. BMW courtesy of Ocean View Motors, Santa Monica, Ca. WARDROBE: Mr. Kotto's wardrobe furnished by Mr. Guy, Beverly Hills. Miss Jones' wardrobe furnished by Gazebo, Beverly Hills.